From the moment it premiered on Fox in the fall of 2013, Dan Goor and Mike Schur’s comedy Brooklyn Nine-Nine has always been something of a low-key high-wire act. In many respects, it’s a conventional workplace sitcom, which is standard fare for a network like Fox and familiar territory for both of its creators (Schur wrote for The Office and created Parks & Recreation, and Goor wrote for the latter show). However, it’s set in a precinct office of the New York Police Department, which complicates some of the usual conventions of a workplace comedy. Much of The Office’s humor was based on the tediousness and unimportance of the work the titular location’s occupants performed, while Parks & Recreation slyly used the seemingly petty and inconsequential concerns of local government officials to push an optimistic message about the potential for civic engagement to lead to positive change. By contrast, it’s impossible to avoid the darker aspects of Brooklyn Nine-Nine’s workplace setting, even though the show generally aims to be a breezy comedy. Cop shows have been network TV’s bread and butter for decades; one of the classics of the genre, Homicide: Life on the Street, featured Andre Braugher, who now plays the Nine-Nine’s captain, Raymond Holt. It’s relatively rare, however, to see an environment in which life-or-death situations frequently arise get the comic treatment. At times, you can almost feel the tension between the show’s tendency to default to silliness and the weightier real-world implications of its subject matter. That tension is what makes the show’s occasional pivots to a more serious tone especially interesting. Past seasons have already touched on matter such as bias in policing, as in the episode where the precinct’s towering sergeant Terry Jeffords (Terry Crews) gets profiled and detained by another cop while he’s off duty. When the show doesn’t feel the need to address social and political issues, it still draws upon the inherent danger of the squad’s daily responsibilities to gin up narrative suspense for major events such as season finales. 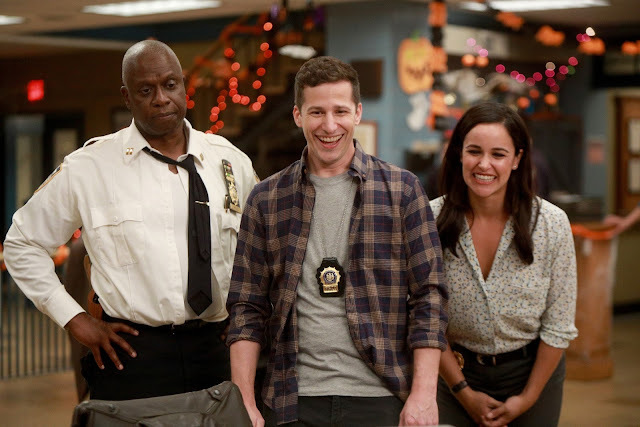 This has become especially noticeable since the end of Season 3, as that portion of the show saw the beginning of an arc that forced Captain Holt and the immature Jake Peralta (Andy Samberg) to flee into witness protection after tangling with a deadly mobster. 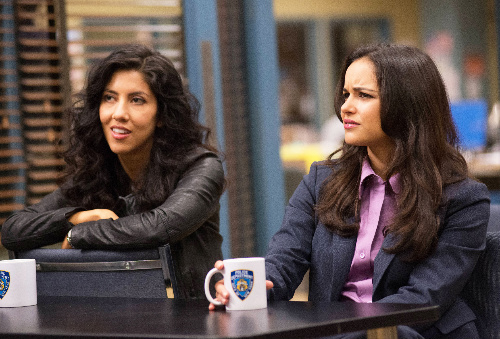 The current season, the show’s fifth, began on even darker note, with Jake and his fellow officer Rosa Diaz (Stephanie Beatriz) in prison after they had been framed by a corrupt cop. Subsequent developments saw Jake scrambling to protect himself from a deadly prison kingpin, which stretched the boundaries of what a show like Brooklyn Nine-Nine could handle in terms of subject matter. It’s hard not to feel a sense of queasiness creep into your experience of watching comic characters suddenly placed in mortal peril, despite – or perhaps because of – the fact that the writers and showrunners have generally maintained the same light tone in most episodes. As indicated by Braugher’s casting, Brooklyn Nine-Nine has always incorporated a certain degree of self-awareness with regards to how it echoes cop shows, mob movies, and its other influences. However, when its narrative takes especially bleak turns, it almost has to begin functioning as an outright parody of these genres, lest the incongruity between subject and tone become untenable. In this regard, it helps that Brooklyn Nine-Nine is an especially well-constructed example of a workplace sitcom. The showrunners have figured out each performer’s niche, and the fact that the cast has remained remarkably stable (supporting cast member Chelsea Peretti’s recent maternity leave was the longest absence of any of the original cast thus far) has allowed them to develop each actor’s shtick. Occasional serious plot twists aside, it’s definitely more of a pure situation comedy than Parks & Recreation – there’s usually a case of the week that provides structure for each episode – and arguably there isn’t the same degree of emotional depth to the characters as in Schur’s previous show. So long as Braugher remains at the center of Brooklyn Nine-Nine, it should remain able to pull off the occasional foray into serious territory. However, it’s hard to see how much darker the show could get than sending two of its main characters to prison, and the fact that it’s passed the 100-episode mark and airs on a network that was recently sold to Disney may mean that it doesn’t have more than a season or so left in it. Regardless, it seems set to continue as a showcase for its writers and cast, at least in the immediate future. Braugher IS hilarious in this. do not watch many cop shows, but Homicide: Life on the Street was one.